Hi there! Yeah, it’s me. Sorry I’ve been absent. There’s been SO much going on that it’s going to take me a while to get everything organized in my brain. 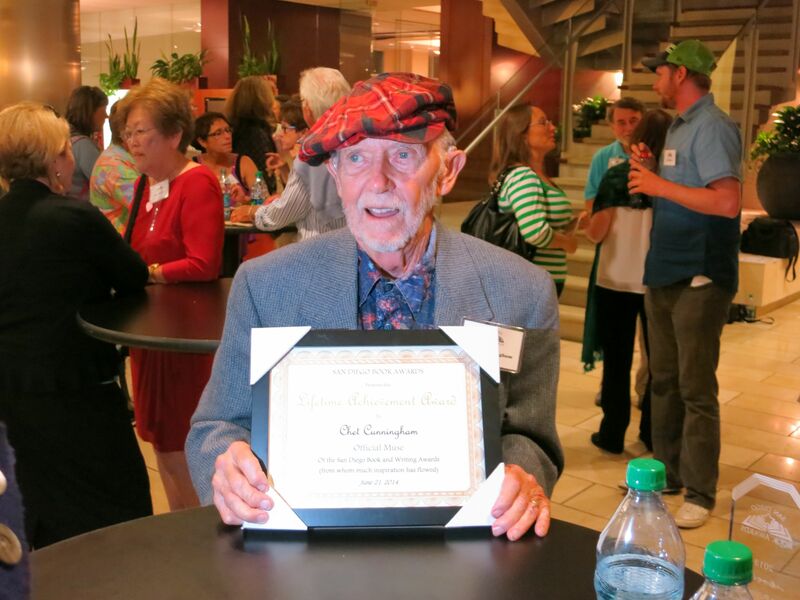 But first off, my dad was given a Lifetime Achievement Award for everything he’s done for the San Diego Book Awards and Read-4-Fun programs (both groups live on donations, by the way). He started those two groups twenty years ago, and they’re still going strong. My husband and I, as well as my brother Greg and his lovely wife Tina, were all there to cheer him on. Chet Cunningham, passing on his wisdom at the San Diego Book Awards night. Photo by Greg Cunningham. Yeah, so everyone stood in front of the projector – but that didn’t lessen his savoire faire. 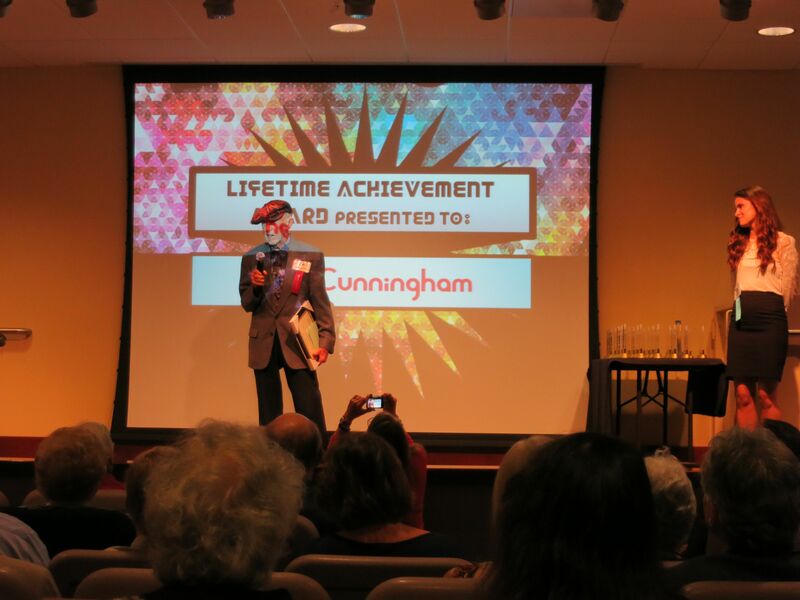 Mark A. Clements presenting the Lifetime Achievement Award to Chet Cunningham, San Diego, June 21, 2014. Photo by Greg Cunningham. Mark A. Clements is SO TALL (about 6’6″ or 6’7″…) and my dad so short, lol! Below, Daddy rocking his Cunningham tartan hat and beard. The San Diego Book Awards ceremony was held about four weeks after he was flooded out of his house. (You can read the first installment and see the photos of that here). On June 21, 2014 I wandered through the house I’d been born in, and it seemed so small. Bare of everything. 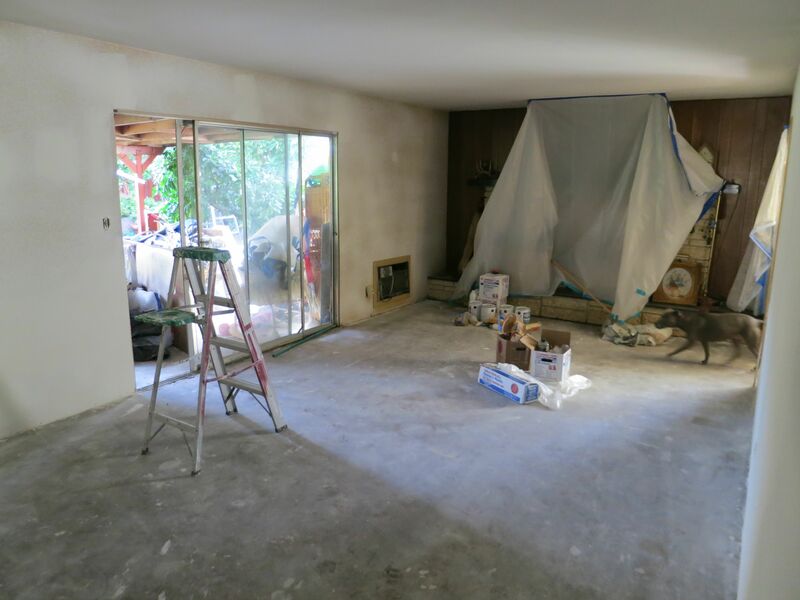 Stripped down to the cement foundation, the house looked awkward, old. It felt chilly despite the warmth of the day, as if everything I’ve grown up with and known is gone forever. But I had to face it. Seeing it that way, while my dad is alive, was sad, yes; but not devastating. As of this writing, Dad’s still not back in his house, but the carpet is in and all the painting is done. (We thought we’d be moving him back in last weekend but it didn’t happen.) As he keeps saying, he’s writing 2K a day because there’s nothing else to do at the residence hotel he’s been staying at (for almost two months now). He’s discombobulated and just wants to get back to his garden, and who can blame him? As for me, I’ve got lots on my plate. Finishing up a Fairy Tale on spec, editing my ballet novel, working on book 2 of the StarTide Talent Agency series, plus coming out with new editions of my Demon series books (plus book 3, finally!). Busy, but that’s the way I like it. OH! And I’m working on a 48-hour Film project at the beginning of August, writing with Mona Deutsch Miller and Cailin Maureen Harrison. It’s Mona’s project – I’m just along for the ride, lol! Plus there are some short plays I’m working on. Busy, it seems, doesn’t begin to describe my life…please add in there the Day Job and family. Whee! I’ll be at the Romance Writers of America Annual National Conference. There’s a HUGE book signing that’s open to the public on Wednesday, July 23rd, from 5:30pm to 8pm – I’m not signing, but I’ll be there helping the authors who are. I’d love to see you! So grab me and tell me how you know me, because I’m terrible with both names and faces, and I promise you a big squishy hug. Here we are, in the middle of summer. Hope yours is going swimmingly! Hug your loved ones and keep positive. Life just keeps on getting better. This entry was posted in Life, Observations, Writing and tagged 48 hour film project, Cailin Maureen Harrison, Christine Ashworth, Mark A. Clements, Mona Deutsch Miller, romance, RWA National Conference, writing. Bookmark the permalink. Congratulations to your dad!! How exciting, hope he’s back in his home soon! You are inspiring me to give ups some of the ‘rules’ I seem to have set for myself, and reach out and try new things writing things mostly. I’m always amazed at how much you do! Have fun at RWA14. Wish I was going to be there! Wow Christine, I’m envious at the energy you have in order to accomplish the multitude of things on your plate… so proud of you. I wished I have a smidgen of that energy to get my mess in order…lol! A big congratulations to your father for his Lifetime Achievement Award. Hard work should be duly recognized and rightly so. I’m glad his home will be ready shortly and he should be right where he is happy, with his garden and all. Marie, I leave the mess alone, lol. There’s no time for it! Hugs and thanks! Congratulations to your dad! He looks chipper and adorable, and yeah he rocked the beard with that snazzy hat. Very inspiring. 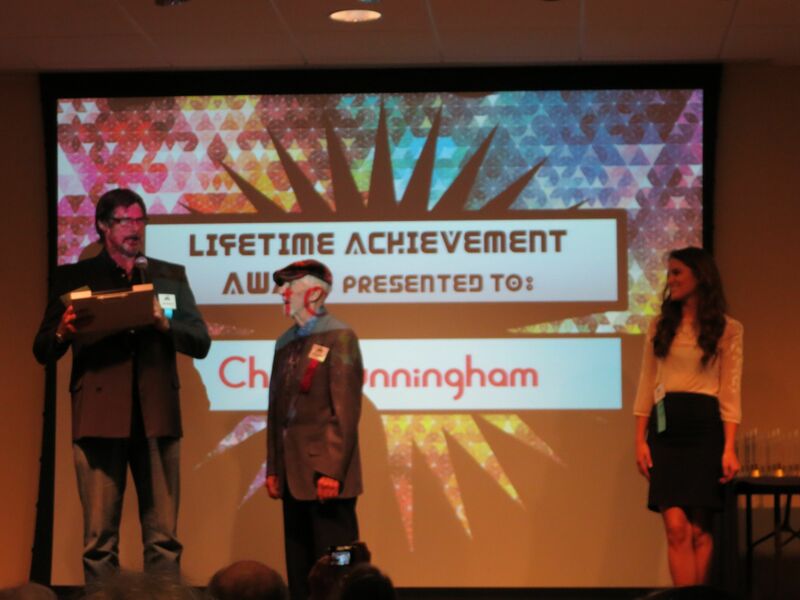 Huge CONGRATS to Chet Cunningham! Hope he’s back home soon. Also hope to see you at RWA! Congrats to your Father on the lifetime achievement award! That’s huge! Glad to hear that the house is coming back together. Sounds like you’re a busy lady!! Enjoy SA. Wish I could be there.